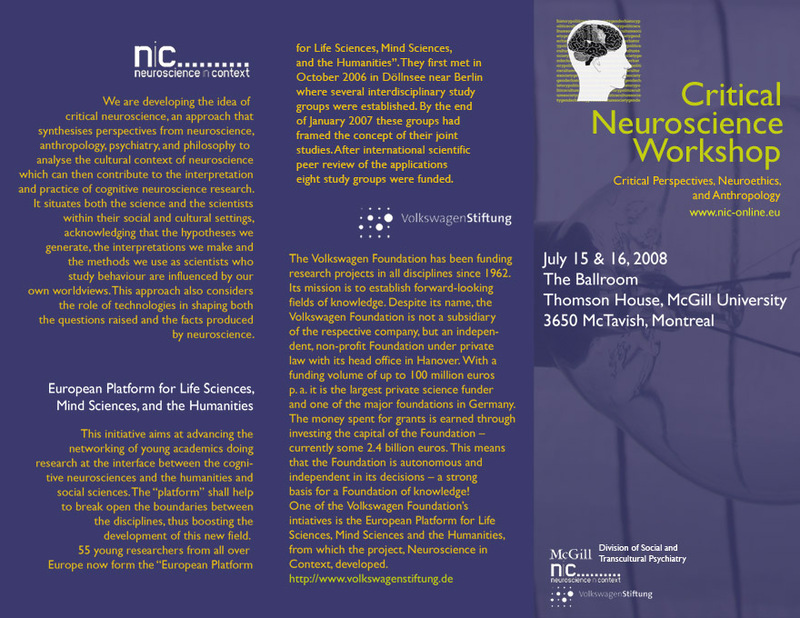 During the Critical Neurosciences Workshop in Montreal, one of the main questions we addressed was, What exactly do we mean by critical neuroscience? What is this field going to be? Various analyses were presented: Is it the five varieties of the cultural brain? How neuroscientists and psychiatrists play to the popular press and get played by Big Pharma? Pointing out how the media can get neuroscience so wrong while reinforcing stereotypes? A round-up of the growing pains and inevitable limitations of science, and its emerging connections to the business world? But in taking a larger look at the conference, I see a set of admirable characteristics in the young scholars there. Interdisciplinary. Not ready to accept the status quo of either just-do-lab-research or criticism-deconstruction-interpretation. Ready to take risks to work towards something that offers more possibilities than doing “good science” accompanied by the inevitable stereotypes and business applications. And these scholars are working in three broad areas, which if developed together, will strengthen and enrich each other. The first area is the obvious one, the emphasis on critical. Drawing on the Frankfurt school and its analysis of science as a core part of modernization and on Foucault and how ideologies and power shape the practice of science, a major theme of the overall conference was to examine how political economy and societal ideals shapes both neuroscience and its impact on society. Neuroscience can reinforce stereotypes, offer tools to companies who seek only profit, and rarely question its own assumptions as it proudly proclaims some aspect of human nature confirmed by its science. It is not a lily white science, protected from the world by the boundaries of lab, producing knowledge unsullied by outside interests. The images of brain, the proclamations of hard-wired differences, its use in law and in advertising—these are things that fall squarely in the public domain. Scientists also bring their own human assumptions and foibles into the lab with them, and those labs are often part of powerful networks, interested in asserting their own power, of getting a larger share of funding and an increased profile in societal decision making. Politics and profit are in the lab, and with them ideologies and manipulations and assertions that shape the overall work of neuroscience. Neuroscience is constructed as much as it is done, and how it gets constructed and used tells us much about ourselves and our society. And for working neuroscientists, a critical perspective helps them better analyze how they might do their work in ways that match ideals other than those who hold power through profit and politics. The second area is also rather obvious, with the emphasis on neuroscience. Critical neuroscience is not simply about placing neuroscience in political economic perspective, it is about the science itself. The organizers Suparna Choudhury and Jan Slaby produced a graphic outlining the complex inter-relations between society and neuroscience in their opening introduction. At the center of it lay two boxes, one entitled mental phenomena and the other brain fact. They were linked by a single line. This assumption, that neuroscience establishes brain facts that are the reductive basis of mental phenomena, is overwhelmingly predominant today. But it is just an assumption, the latest iteration of the mind-body dichotomy that Descartes bequeathed us. For some this mental phenomena-brain fact equivalence is woefully wrong, for others it is merely incomplete, for certainly mental phenomena are grounded in some way in the operations of the brain. Ian Gold certainly pointed out the flaws in the reductive “brain fact” approach, for it loses out on the rich behavioral and psychological aspects that are a formative part of mental phenomena. At present, neurobiology provides an account of local biological function; the rest is a tantalizing but often overblown analogy. The emerging field of social neuroscience and the even more recent focus on the cultural brain raise new ways of thinking about how neuroscience can step in to help explain mental life and our everyday behavior. But these interdisciplinary endeavors also place the onus on creating new ways of doing laboratory research and of working with a wider range of ideas than the old-science-as-usual. The “I’ve got brain facts, and that’s better than what you’ve got” might work on a societal level (particularly when accompanied by pretty images), but it does not lead to a new set of assumptions underlying the scientific work, nor indicate novel experimental approaches. In this particular workshop, more time was spent on the critical side than on the neuroscience side, but the organizers made it clear that this is a crucial part of what they are working on. Equally important, in the end, is to also find ways to link from critical analysis into laboratory and experimental practice. What sorts of assumptions might emerge from critical theory, and could neuroscience test those? It remains an open question. The final area I’ll call “neuroscience for change.” Critical theory brings with it a sense of political and ethical awareness, where our efforts can do more than just play to stereotype and give scientists a well-remunerated living. The “brain” is becoming a central societal metaphor. Psychopharmaceuticals have an increasing impact. Neuroimaging is one of the celebrated technologies of our days. Can neuroscience do more than simply continue on with business-as-usual? Should it? Obviously neuroscience is having an increasing impact on our world, and critical neuroscience highlights the need to take active responsibility for that impact. Alongside adding to the scientific understanding of ourselves, will there be an emancipatory aspect to its research? Will it confirm that mind-body dichotomy or work towards a different sense of enlightenment? Can it question the way we construct our lives? Even provide evidence that shows the pernicious effects of societal structures and ideologies? Can an interdisciplinary brain science advocate for change? Can it help people in other ways than providing new ways of manipulating their brain chemisty? These are important questions that critical neuroscience asks. It is clear that most neuroscientists do not question the political economic or brain fact aspects of their work. These get packaged in from the start of their careers, along with all sorts of implicit guidelines on what neuroscience is for and what it can do. By asking creative questions about the purposes of their work, and what it might accomplish, neuroscientists could move in new directions. Whether that will ever result in something as radical as “neuroscientists for change” remains an open question. A hopeful question. Hi, I want to know if there are any graduate programs on Critical Neuroscience and where.